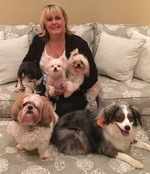 Pet Shoppe Boutique was created by animal lovers for animal lovers. Our passion is endless for animals in need. Our mission is to help save the lives of many dogs that would otherwise be euthanized for their incontinence or inability to housetrain. Our homemade products give the pet a life of happiness and the owner, peace of mind. Our own 5 Special Needs Babies are the loves of our lives and the root of inspiration. Enjoy their stories below. Our Pebbles was turned over to rescue at a mere 10 weeks old for her inability to walk when she was born. We adopted her right away and knew the challenge that lied ahead to give her the ability to walk. After countless laps in the tub, she developed the muscles needed to pull her legs up underneath her. With continued therapy she soon was running and playing with her siblings. Now 12 years later she has a heart condition and thyroid issues but lives life to the fullest every day. UPDATE: It is with tremendous sadness that our Pebbles left for the Rainbow Bridge on Nov 25 to join her sisters. Meet our little Yukon. A 10 year old Pomeranian. Yukon is the direct result of irresponsible mill breeding. Due to genetic defects he was born with no eyeballs. Even though he is blind, and has major alopecia issues, Yukon loves life and his siblings. At a tiny 4 pounds, he loves to snuggle, cuddle, dance and wrestle. Being sightless has not stopped him from enjoying all the pleasures of life. He is forever loved by our family. Our little Mister, an 9 year old Shih Tzu was abandoned when he was 5. We immediately adopted him not knowing his history. Once home with us his psychological behavior was closely observed. He was aggressive and a biter, and clear signs he had been physically abused. After months of our in home rehab his behavior improved tremendously. He is now loving and playful with his siblings. Mister has developed degenerative disc disease but that doesn't slow him down. 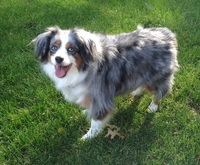 Meet Adisyn, our 8 year old blue merle Mini Australian Shepherd. Addie as we call her, is the life of the party. Adopted at 12 weeks old, she is extremely loyal and loves to try and herd her siblings. Addie is most happy when her human brother Spencer is home from college to play ball with her. She has a luxating patella which periodically flares up with pain but not enough to require surgery as of yet. The fabulous orthopedic team at Michigan State University are monitoring her joint. Say hello to Winifred or Winnie as we call her. She is truly daddy's baby girl. A Shih Tzu - Maltese mix, Winnie is a special baby born on Christmas Day. Her breeder left her with a rescue when she was just a few weeks old. We adopted her at 8 weeks old and a teeny tiny pound and a half. She is spunky regardless of having no hip joint on one side. Her lower leg joint is fused causing her to run peg legged. The muscles, tendons and ligaments hold everything in place without the hip bone. She spent nearly a year in intense physical therapy to save her leg from amputation. Winnie is closely monitored by her favorite orthopedic surgeon, Dr. DeJardin at Michigan State University. As the tiniest and youngest member of our family at almost 7 years old, she has the biggest personality and is the Alpha.